Save your cash on the usual wedding trimmings and get hitched with a drive through wedding service in Las Vegas. Simply hop in your car and drive on over to the chapel! 12 professional portraits are included so you won't forget this special day. You'll be married as quickly as it takes to order a cheeseburger! Important Note: Each booking must have 2 people only. On your big day you will drive to the courthouse to collect your marriage license. 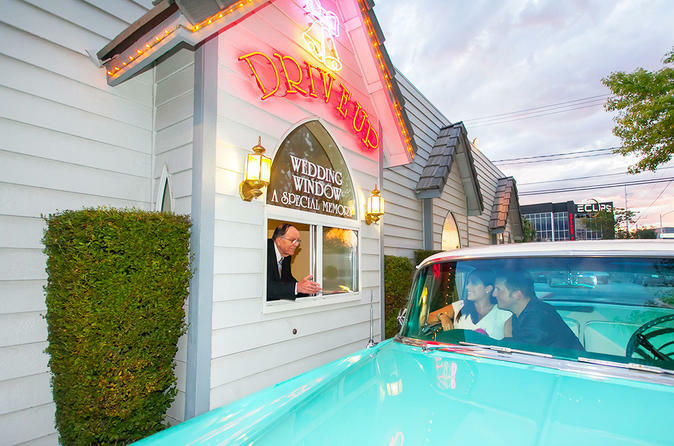 With documents in hand you will continue to the famous drive through window at A Special Memory Wedding Chapel where a minister will perform your nuptials. This unique Las Vegas wedding package includes flowers and professional portraits. Upgrade to the Supersize package to commemorate your day with private limousine transportation, a professional DVD of your ceremony and a novelty license plate. When you have done everything else there is to do in Vegas, here's one more thing to tick off the list! The listed price does not include fees for the minister, $50.00, Marriage License, $60.00 and Driver Gratuity, $35.00 (if Supersize Package is selected). The fee is required by our local supplier and is not within our control. Basic Package does not include limousine transportation.